Bellevue is 3-stars hotel, built for those who look for calmness, home coziness, special personal attention, good cooking and wholesome food. 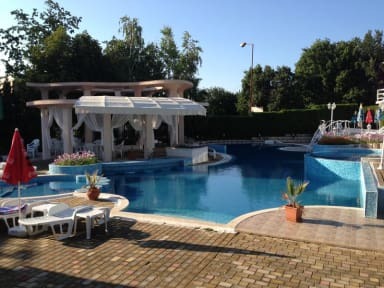 Our price list is conformable to the proposed services quality as well as to the opportunity for large number of guests. The Bellevue hotel is situated in the south part of the Golden Sands National Park. Surrounded by the freshness of a virgin forest, the hotel offers to its visitors the amazing sea panorama of the North Black Sea coast. Beautiful View is the meaning of the hotel's name, given by the unique view that opens from the complex terraces. All the rooms and common parts of the Bellevue hotel are centrally sound-screened. 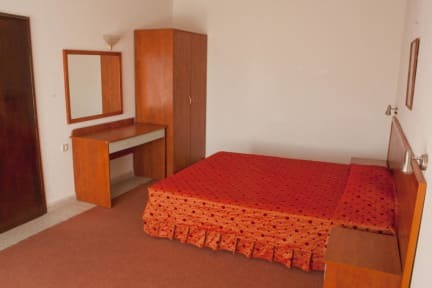 In perfect combination of comfort and coziness the rooms are equipped with phone, TV, AC and fridge. There is a separate terrace at each room. A Room service is available from 8 am to 11 pm for the visitors.